Marian Hudson, administrative assistant in Housing and Conference Services, is the 2015 winner of the Helen W. Jenkins Lifetime Achievement Award. Her responsibilities include coordinating keys for the university's more than 20 residence halls, as well as sorority, fraternity and theme housing facilities and assorted staff offices. Photo by Matt Cone. As Emory students moved into residence halls for the start of the new academic year, their thoughts may have focused on how they would decorate or how much fun they would have with their roommates. Yet before any of this could happen, they all needed the same thing — keys, thousands of them. The person organizing this massive effort doesn't typically stand in the spotlight. But when the 2015 Helen W. Jenkins Lifetime Achievement Award was presented at the Emory Campus Life Annual CLASS Awards Ceremony last spring, the recipient was among the few surprised people in the ballroom. Marian Hudson, administrative assistant in Housing and Conference Services, has earned the appreciation, respect and affection of countless students, staff and faculty members during her 33 years of service to the university and Emory Campus Life. The achievement award, named for the division's former senior food service liaison, is presented only when a deserving candidate appears — one who has demonstrated a lifetime commitment as an employee or associate of Campus Life. "Marian was the person many students went to with their problems, not only for someone to listen but also for help connecting with other staff who could assist them," says Ben Perlman, who knew Hudson in the 1990s when he was a student and now serves as director of the Dobbs University Center. "She is part of the fabric of this university — a relationship-builder and historian," Perlman adds. "And that's what makes her a dynamic force in forging relationships with students and assisting them in their times of need." Sherry Ebrahimi, another former student, agrees. 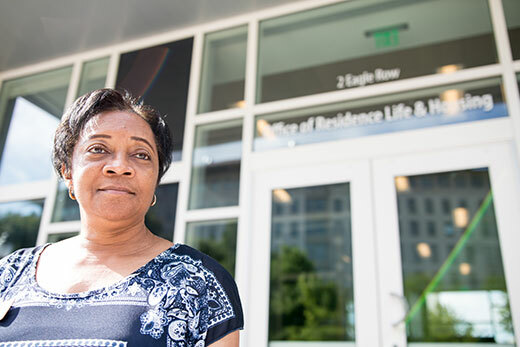 "When I came to Emory in 1993, Marian was the rock, the friendly smile, and the source of information for everyone in Residence Life and Housing — and she still is today," says Ebrahimi, now director of Conference Services. "Marian is one of the most caring staff members I have worked with at Emory." What has kept Hudson at the university and in Emory Campus Life for more than three decades? "I like what I do. I like meeting new people. And I love a challenge," says Hudson. "I just do what needs to be done, whether it's in my job description or not." Her biggest responsibility, according to Hudson, is coordinating keys for the university's more than 20 residence halls, as well as sorority, fraternity and theme housing facilities and assorted staff offices. She keeps track of thousands of keys — issuing new ones, replacing lost ones, approving lock changes and storing spare keys. Hudson also embraces Emory's tradition of service to the community beyond the campus. Every November for the past 15 years, she has identified a family in need — two families each year for the past five — and provided complete Thanksgiving dinners, which she personally delivers. The commitment to hard work and helping others is rooted in Hudson's childhood on a farm in Dora, Alabama, where there was plenty of physical labor for every member of her extended family. "We picked corn and peas and fed the hogs and chickens," she recalls. "I learned to appreciate hard work early in my life." Growing up black in the segregated South of the 1950s and 1960s often presented challenges far harsher than farm labor, Hudson points out, recalling segregated and unequal public facilities, including schools, restrooms and drinking fountains. "Racism and the threat of violence were very real in my early life." Nonetheless, Hudson enjoyed a good childhood in a loving family with plenty of outdoors to roam, orchards to visit, and berries to pick. Her mother was a schoolteacher who valued education and, with a father and grandfather who were ordained ministers, religious faith also played a major role in family life. The cooperation that sustained Hudson's family impressed upon her the importance of collaboration with and service to others. Parents and grandparents regularly underscored that lesson through word and deed. "They taught us to do right and respect other people," she says. In the early 1970s, Hudson relocated to Atlanta where she worked for several years before joining the still-new Emory Campus Life organization in 1982. Her hiring manager was Joe Moon, now dean for Campus Life at Oxford College. "There were no cubicles and our central office was usually loud," Moon recalls. "And there was soft-spoken, petite Marian Hudson in the middle of it all — quietly doing her work, staying apart from the fray, and managing to keep her sense of humor and positive attitude intact." Of the countless kudos accorded Hudson over the years, one from her first Emory supervisor may best capsulize them all. "Marian Hudson deserves much of the credit for the early successes of Residence Life at Emory and has certainly been a tremendous asset to Emory all these years as Residence Life and Campus Life developed," says Moon. "I am honored to have her good spirit in my life."